The Transporter Room (Cat. No 22803), an elusive UK exclusive. This accessory was sold by the Bradgate Division of Palitoy in the UK, and took the place of the Enterprise Playset in Great Britain. The name “Mego” appears nowhere on the packaging; the only evidence which betrays its state-side origins is the imprint of “© MEGO 1975” on the top of the toy. The Transporter Room toy was merely a reworking of the Transporter mechanism from the Enterprise Playset. Palitoy took the basic blue plastic housing and black tumbler, added a yellow plastic stylized roof, and voila!–one more toy variant for Mego collectors to track down. It is not known for certain exactly why this UK Transporter substitution was felt necessary by Palitoy, but the following theory has been put forth: It is possible that this was a shipping cost-saving measure. The vinyl housing of the Enterprise was manufactured in the United States, but the plastic accessories–including the Transporter Unit–were made in Hong Kong. Assuming that Palitoy would have had to assemble any Enterprise Playsets themselves once all of the components arrived in the UK, the economical aspect of this choice becomes clear. 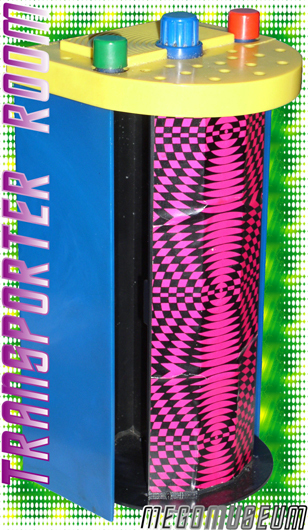 Palitoy avoided the exorbitant manufacturing and freight costs altogether by instead focusing on what was arguably the coolest part of the playset–the Transporter Room–and just released that. 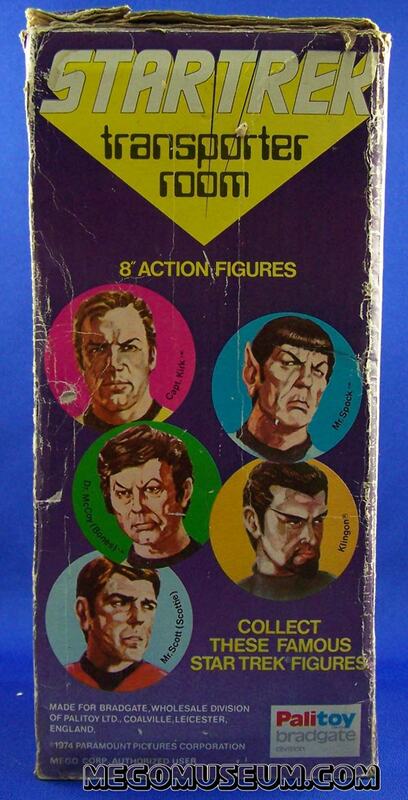 * Like its cousins, the French and Canadian Enterprise Playsets, the stylized “Transporter Effect” stickers were not included as six separate strips that had to be applied onto the toy by the child. Instead, two large labels–one on each side of the tumbler–were applied as part of the manufacturing process. 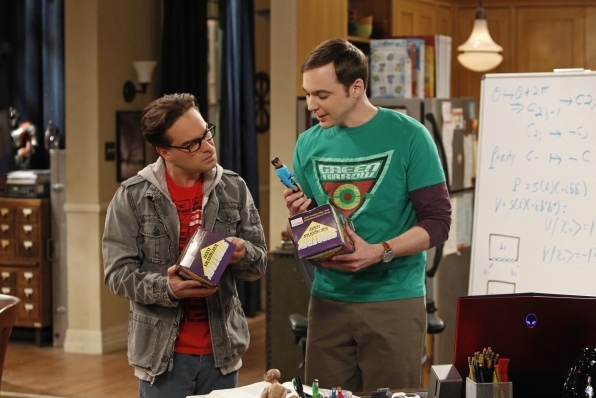 * The only other thing contained within the box besides the Transporter itself is a square cardboard “spacer” which sits at the bottom of the package underneath the Transporter. This is worth mentioning because it is often missing. 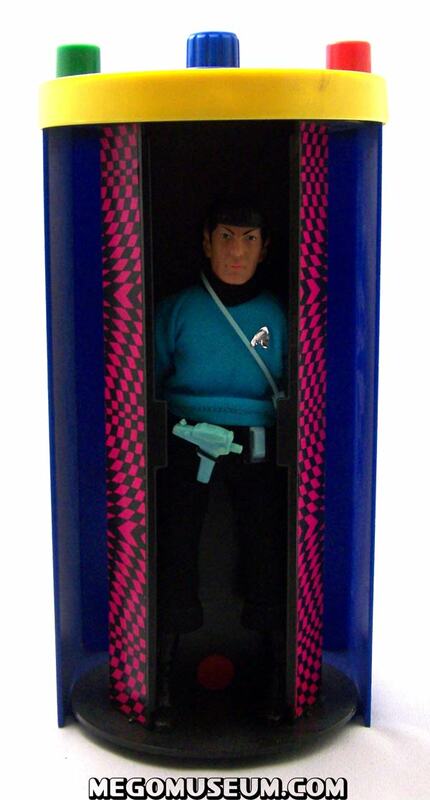 * Interestingly, Mego had originally intended for the “Transporter Effect” labels on the Enterprise to be printed in magenta and black. 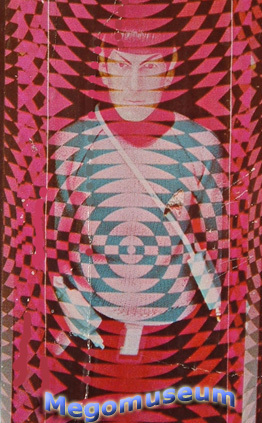 This is evidenced by the prototype picture of the playset on the back of “6-face” cards. For reasons unknown, Mego changed their minds and went with a yellow/black motif. 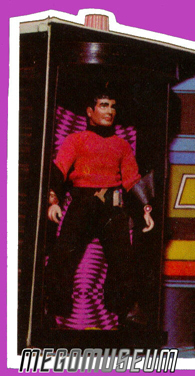 It would take another manufacturer in another country to finally make good on Mego’s original design intent. 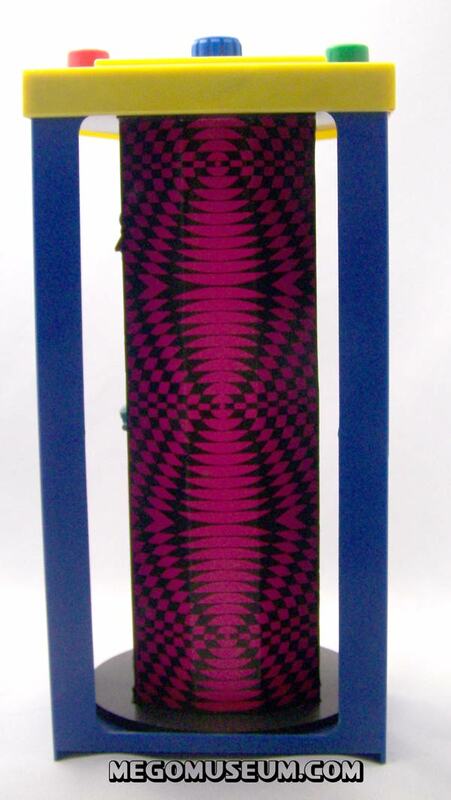 * The British were apparently very keen on the design and play-value of this toy, as Denys Fisher would later employ the same mechanism ,albeit in a slightly larger scale, in the TARDIS accessory for their “Doctor Who” line of 9″ action figures. 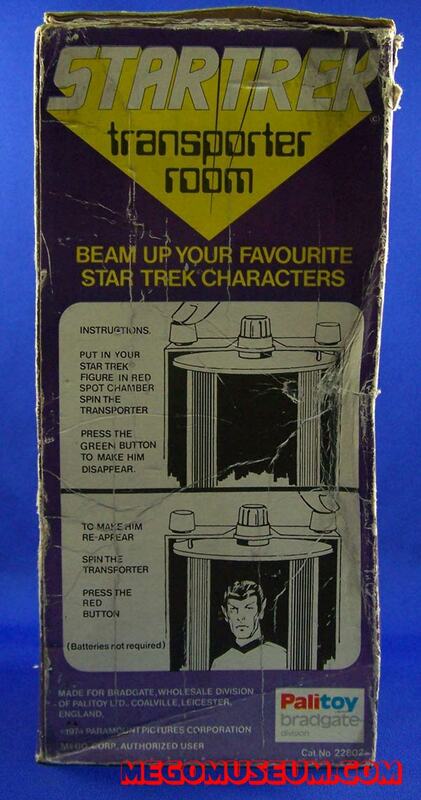 Box for Palitoy Star Trek Transporter Room. 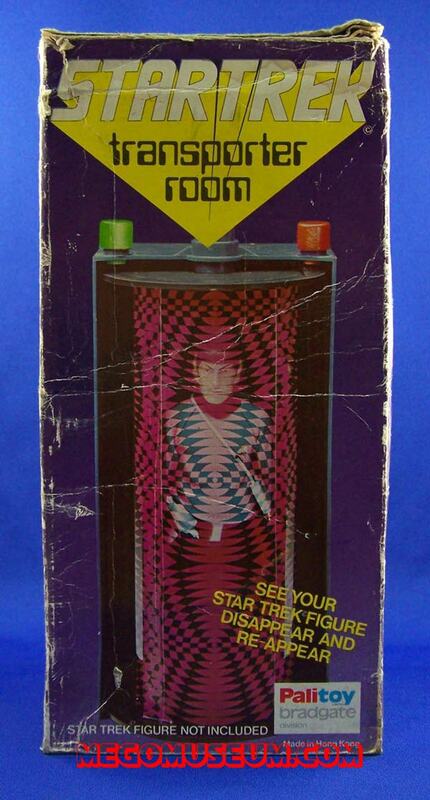 Palitoy Star Trek Transporter Room Box. 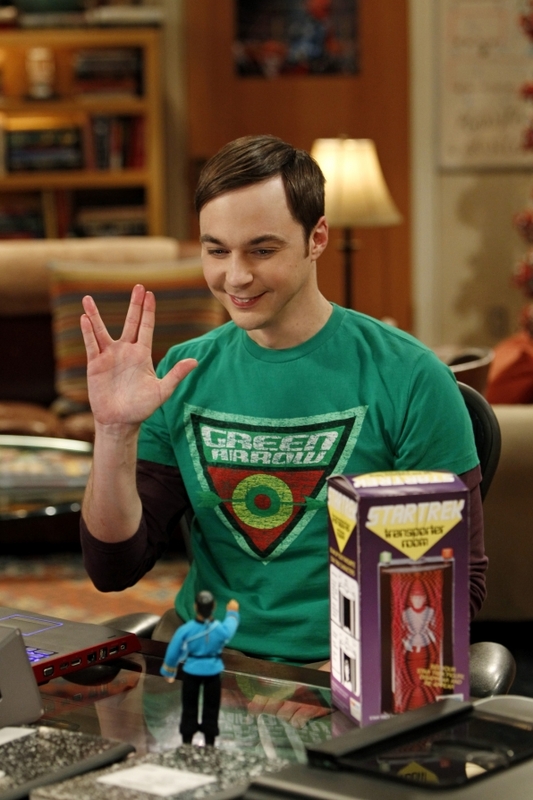 The Transporter featured heavily in a March 2012 episode of “The Big Bang Theory” on CBS, the plot centered around Sheldon’s conversations with a Mego Spock figure (voiced by Leonard Nimoy) as to keep the item mint in box or play with it. We’re happy to report that the word “Mego” was pronounced correctly.